Style and Design : Can you keep a secret? I found the most amazing website!!! and now I'm goung to buy myself a nice treat!! 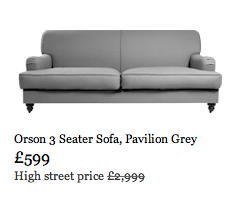 I can't believe they sell this sofa for only £599 instead of £2.999. There also are some beautiful tables and chairs... here is the link, but keep it to yourself! Fantastic website, thanks for the tip! Visit Elena M.'s profile on Pinterest.